A component for the charger, GPP (glass passivated package) bridge rectifiers, should soon enter "volume" shipments from Lite-On Semiconductor, DigiTimes sources said. The manufacturer is in fact expected to see double-digit sequential growth in the June quarter, fueled primarily by AirPower demand. Signs have been mounting of an imminent AirPower launch. Hidden references and graphics have been found at Apple's Australian website, and multiple reports have pointed to it being in production. Most significantly support is included in iOS 12.2 beta 6, which could mean that the only thing holding Apple back is the launch of iOS and watchOS updates. 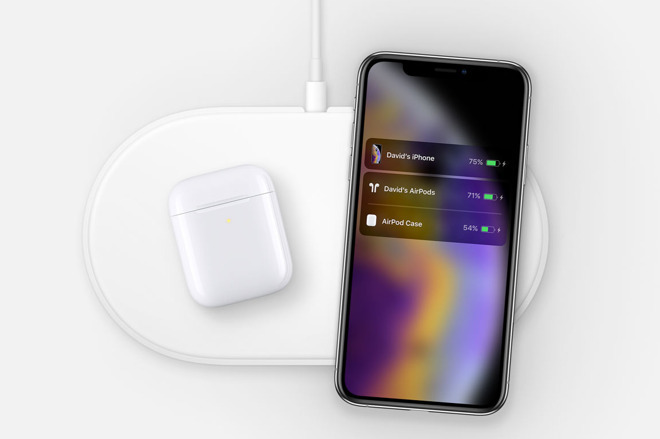 Apple originally announced the AirPower in September 2017 with a broad 2018 launch window. That time came and went without any official news, leading some people to wonder if it had been quietly canceled. It might make sense for Apple to launch the AirPower next week, possibly during its March 25 press event. That gathering will focus mostly on a long-anticipated video streaming service, as well as paid Apple News subscriptions. Is three months overdue really “long delayed”? I understand that people heard “2018” and were hopeful that it would be Q1 or maybe Q2. However, hoping for early 2018 and not getting early 2018 does not Apple missed a promised time frame. In fact, as has been noted quite often, Apple has been virtually silent about AirPower and we’ve just been running on rumors and speculation. Bottom line: Apple expected and announced a 2018 launch date and that was missed. If AirPower ships in March of 2019 it’s just a 3 month delay, not that terrible. I would respectfully disagree, it was preannounced with the iPhone X, which had wireless charging capabilities and was due to be released late November 2017. I, for one, hoped that AirPower would be released in early 2018, in order to use it with my new iPhone X. I feel it is a full year late for what I personally wanted. You can disagree until the cows come home, but the fact that you “hoped [it] would be released in early 2018” doesn’t change that Apple never promised early 2018 (or any specific date for that matter). Moreover you can wirelessly charge an iPhone X with just about any commercially available wireless charger. Yeah not exactly new - similar to the timeframe they announced the Watch to drop, and it was of course the last possible month to still make it. This is the problem with pre-announcing. But when they don’t people get rowdy too. Can’t win. So, whaddya think? $299? $399? It would be extraordinary if this retailed for $199. I agree, one can charge it with any third party wireless charger, but it isn’t the most elegant solution from a company that takes pride in fretting over details. One of the things that made Apple special for me was that it liked to pleasantly surprise you (“one more thing!”), and I feel that they missed an opportunity to do so with AirPower. If a component for the charger will soon enter production, how does the charger itself launch "possibly in large quantities" within the next nine days? Once again, Apple can charge whatever they want for it and people will either buy it or not. Much like the whining-fest that accompanied the release of a $1000 iPhone we now know that price was no obstacle for the hoards that bought them. Today competitors have phones that cost that much and more an no one is whining anymore. But be assured that whatever they are priced at the Apple tech blog forums will explode in outrage and castigation. Once the engineering for AirPower is known the Chinese knock-off factories will be churning out cheap copies to sell on Alibaba and Amazon. Actually, announcing a product, missing a year-long release target, virtual silence . . . pretty well defines vaporware. You do understand that the thing was in development before it was announced and not just after? At least that's how it should have been. I don't doubt this thing will be released. What I don't understand is why anyone should care that much. What part of your comment disputes that 3 months overdue is (assuming the article is correct and AirPower ships in March) not that long? Also, I was under the impression that vaporware was a product that was announced but never shipped, not hasn’t shipped yet. This article states that rumors are saying it will ship this month. So you're saying they shouldn't have done a pre-announcement, and offered nothing in the category until it was ready? Entirely reasonable position, but then others will give them grief for being "left behind". Wait, what was the release target? They only said 2018. Like he said, if they release it next week it's 3 mos past the target. Not life-ruining. "Look for the AirPower charger next year," said Phil Schiller, when announcing AirPower in Sept 2017. He didn't say look for it Jan 1, 2018... he didn't mention any specific date. So 3 months delay sounds about right.. Most significantly support is included in iOS 12.2 beta 6, which could mean that the only thing holding Apple back is the launch of iOS and watchOS updates. AirPower requires iOS 12.2 which is not released yet. It wouldn't surprise anyone for it to be released on Monday or Tuesday with AirPower right behind it. I don't think anyone expects it to exceed $199. I think $199 exactly is the single highest-likelihood price point. There is also no chance I would buy it if it exceeds $199. For the value it offers, I would consider $149 to be fair, and $199 to be Apple-fair. Anything beyond that would be absurd and offensive. So, whaddya think? $299? $399? Well if it's that much, I won't be buying one. Actually, I probably won't even buy one for $199, plugging my phone in the charger cord works just fine for me. Same for the watch charger. Might make things a bit more orderly around my nightstand but not $199 worth. I have to agree. There are too many options out there for charging. Someone here said $299.00 or $399.00..hopefully that was a joke. It would be beyond insane even for Apple to price a charger that high. $79.00 - 99.00 would be a price I could deal with. I feel like $129.00 is going to be the price though when it is actually released.. Just a feeling I have..